The Bookings By Location Report is great for users who have multiple locations set up on their Gather accounts! This tool can help you to compare data across locations. The 'Bookings By' Reports will automatically be filtered by Event Date: Last 12 Months with Status of Confirmed, Tentative, Prospect, Closed and None. 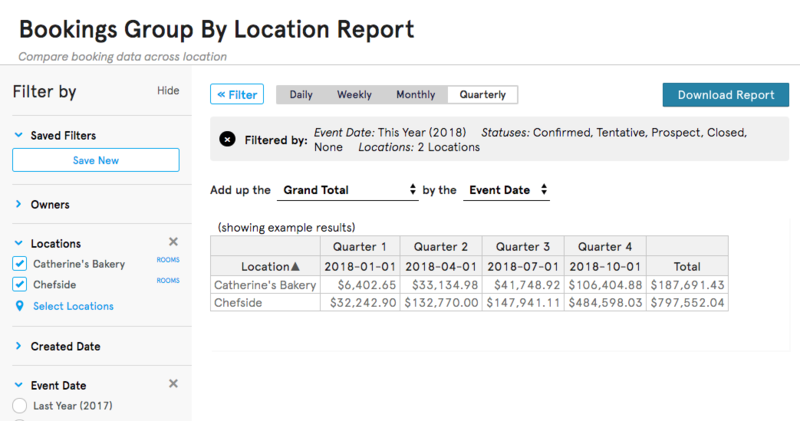 Adjust each filter (Owners, Locations, Created Date, Event Date, Statuses) to generate a specific report. Now you can choose how each column will be calculated - either by the 'Event Date' or 'Created Date'.